These findings are based on the first 1,000 valid responses to an online survey posted in February 2013, as part of my study of the Bitcoin community. For more on this survey see the overview page. The average user is a 32.1 year old libertarian male. Far more people have used Bitcoin for donations than for illegal transactions. 36.7% of users do not drink, smoke, gamble, or take drugs. The “average Bitcoin user” is male (95.2%), 32.1 years old, libertarian / anarcho-capitalist (44.3%), non-religious (61.8%), with a full time job (44.7%), and is in a relationship (55.6%). But of course there is no such thing as an average Bitcoin user, and flattening out the figures like that ignores the large numbers of users who are Christian (20.6%) or single (38.8%). Also by using the broadest possible terms (ie including liberals and environmentalists), you get a left-of-centre contingent with over 38.5% of users. The arrival of new users correlates with price and media coverage, with Q2 2011 the most popular quarter for the question “When did you first install the Bitcoin client” (most of the responses were collected before the recent price rise). The biggest motivation in exploring Bitcoin is curiosity (4.3/5), followed by profit (3.7/5) and politics (3.6/5). Trailing behind are practical concerns (3.1/5), challenge (2.8/5), and community (2.7/5). The age distribution around the mean average of 32.1 is interesting. Instead of a classic bell curve, the community has twin peaks at 26 years old and 30 years old, followed by a substantial long tail of users in their thirties and forties. The standard deviation is 10.6 years. Just over half of users have mined bitcoins, most of them as part of a mining pool. The average non-zero hash rate (using geometric mean) is 399 MH/s, and the median is 200 MH/s. The average miner has spent $3,013 on a rig, but the spread is huge. The median spend is $300, 37% of miners have spent nothing, while 8% have spent $10,000 or more. How does a miner spend nothing? Well 8.5% of respondents have mined bitcoins on someone else’s hardware, so that’s one way to do it. As expected Bitcointalk.org is the dominant platform of discussion, used by 54.1% of users. Reddit (38.5%) also had a strong showing, as did Facebook (25.5%). IRC was used by only 19.6%. Twitter, Google+, and Bitcoin.it Wiki were the only other platforms over 10%. The greatest community fear for Bitcoin is “regulatory/legal intervention” (31.2%) followed by ”reputation problems” (17.6%). A large number of people answered “Other” and in the free-form field wrote to the effect that Bitcoin was too technically demanding for mainstream use. Despite its hedonistic reputation, the Bitcoin community has a contingent of clean-living ascetics, 36.7% of respondents do not drink, smoke, take drugs, or gamble. Only 10.6% of respondents have used BTC to buy narcotics. In fact the most common use of bitcoins was for gifts/donations (35.0%), while computer services was also quite high (25.6%). Overall more people seem to find Bitcoin intellectually rewarding (67.8% have learned more about cryptography) than socially rewarding (18.9% have made friends). You can also download the raw data to play with. Bitcoin is my dissertation topic, so any satoshis sent my way will be gifted and spent within the Bitcoin economy, strictly in the name of research! Hi. Great survey work! 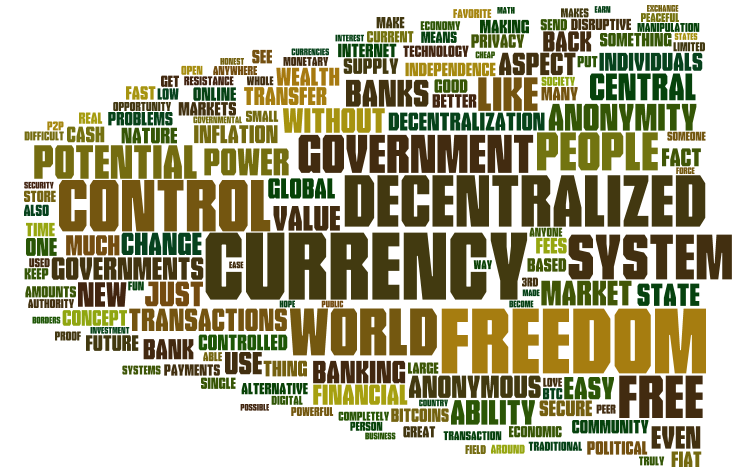 Any chance of getting a high-resolution or vector image of the Wordle? I’m thinking poster-sized at 300dpi. Thanks for this survey, I’d been wondering about this! I’m appalled about the gender ratio, but was motivated to join bitcointalk because of it. At least the political views are pretty diverse. Glad you liked it! And I’m keen to explore the gender question more, I’ve never seen it mentioned in any other commentary about Bitcoin. Thanks for the detailed info, but I originally came here to find demographics of countries participating in the bitcoin market… did I miss something or has this info not been gathered? Depending on your definitions, no countries or all countries are participating in the Bitcoin market. Do you mean you’re just looking for demographics about countries? Google Public Data Explorer might be a good place to start. I am in the process of finalising the uploads but I use some of the same techniques as you. Since Libertarians have been denouncing Bitcoin as a Ponzi scheme, I think this is nonsense.